Guy Bates who has joined Linfield. Guy Bates has let Glenavon down says manager Gary Hamilton. 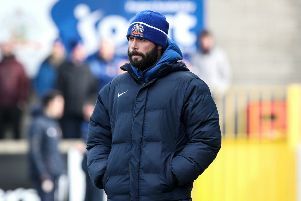 The Glenavon boss hit out after it was revealed the 29-year-old Newcastle born striker had been released from his contract for a undisclosed fee to sign a two year deal with Linfield on Saturday. “Guy gave his word to us and the fans when he left for Australia that if he came back to the Irish League it would be to Glenavon. I feel he has let us all down. He is not a man of is word,” said Hamilton. “He obviously put Linfield first and in asking for his release last week it was clear he did not want to come back to Glenavon. There is not much you can do if a player does not want to play for you so we agreed a fee with Linfield for his release. Bates, who made over 50 appearances for Glenavon and scored 26 goals, will be back in the Irish League this season playing in the blue of Linfield. However, fans may not loose too much sleep of not having Bates back in the team, the facts show the team scored more goals and finished in a higher league position last season without him.